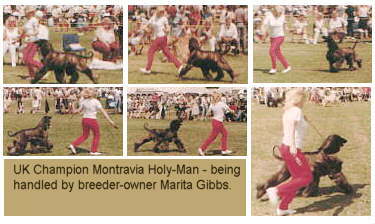 The above series of photographs (please read from left to right for correct sequence) were taken at Windsor Championship Show (UK) around 1986 and feature Marita Gibbs handling her homebred champion Montravia Holy Man. Marita has been handling dogs since a child and handled the first Afghan to win BIS at Crufts in 1983, two years later she handled a Poodle to BIS at Crufts. As a novice myself in the early 80's Marita's handling style and technique were an obvious model for to follow. Marita is ever attentive to her exhibits in the ring, she has that natural affinity and raport with the dog who seems to "want to show for her". Her style is based on a loose lead, slipped high on the neck behind the ears, and making full use of the space available. Marita is mainly active in Poodles where Montravia have been a leading light for the last decade, if not longer.